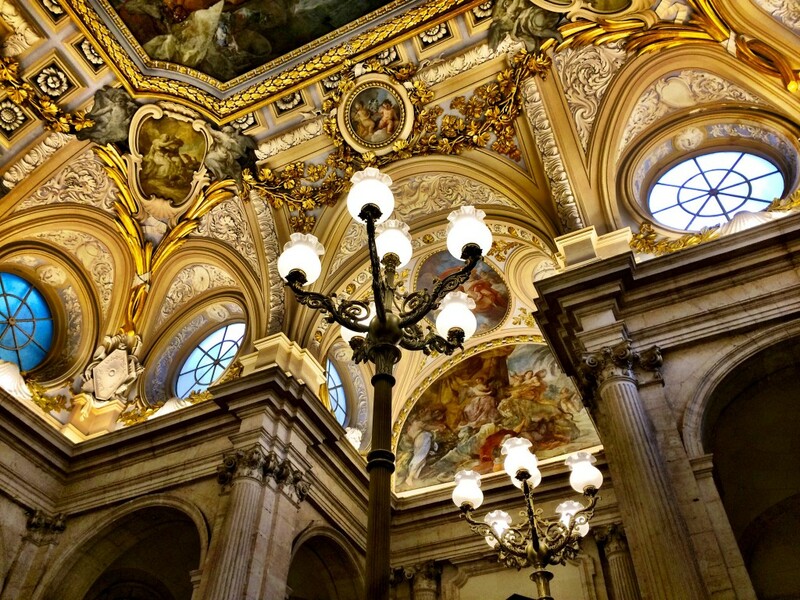 Discovering Madrid: Becoming a Tourist at Home » Lavi was here. Ok, this is silly: I’ve lived in Madrid for almost five months now, and I’ve barely written about it at all. I love my new (albeit temporary) home city, but I’ll be the first one to admit that in the past few months I haven’t done much here in terms of touring Madrid. 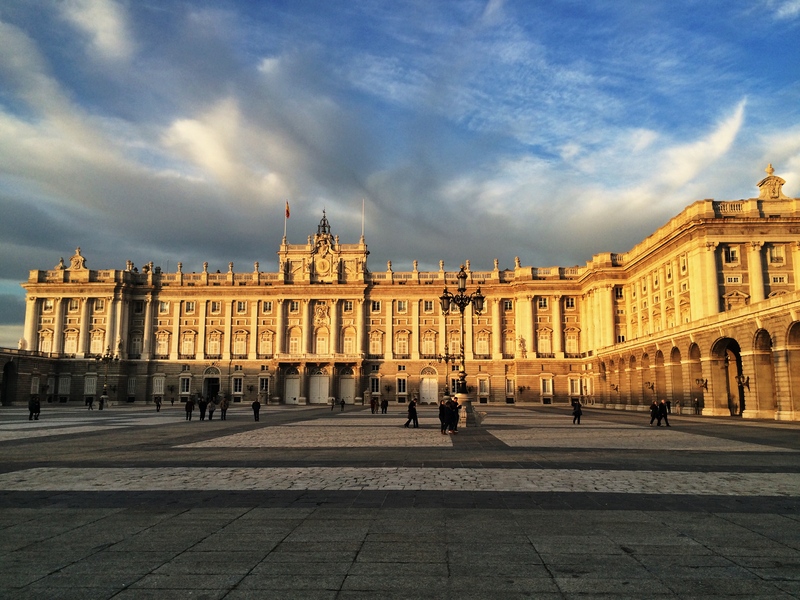 I saw some of the sights on my hostel’s walking tour when I was visiting Madrid for a few days in October 2013, but when I moved here, nada. I’ll chalk it up to the fact that living abroad does not equal traveling. I’m working here and my responsibilities keep me busier than I would be if I was a tourist. 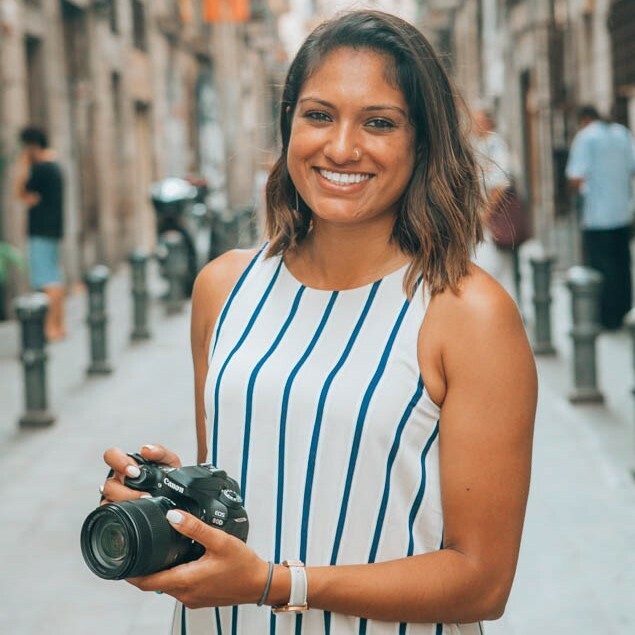 Exploring Madrid was always on my “to-do” list for weekends in which I wasn’t traveling, but even those get jammed up with going out with friends, catching up on life, and the inevitable Spanish siesta. The idea of “touring” a city that I’m living in felt daunting. Although I like hostel walking tours to learn about the history and background of a city, I’d rather explore on my own, and there is a lot to see and do here. After my two-week trip through Europe over Christmas holidays, I returned home exhausted and ready to hunker down for a few weeks. 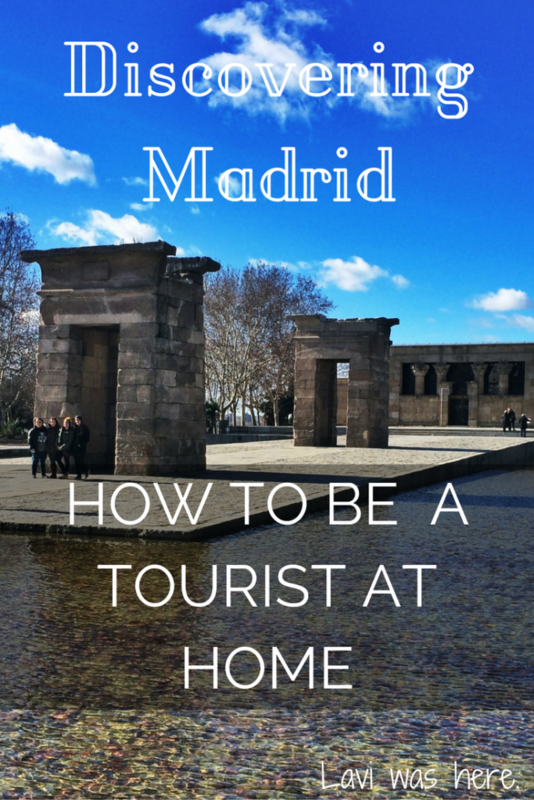 This was my chance to finally conduct my own personal walking tour of Madrid for myself! It didn’t hurt that a few friends were visiting me so I had someone to dish out my (somewhat sparse) historical knowledge I’ve acquired! This Egyptian temple was donated and reassembled in the center of Madrid. Overlooking Casa de Campo, a huge park in the city, I love this peaceful corner of Madrid close to my neighborhood. It was the perfect place to throw on my proverbial Hawaiian shirt and fanny pack and start this excessive photo-filled excursion. One day, I will come here at sunrise before anyone is here so that I can snap a photo with no random people in it. One day. Having lived in New York City for four years, Central Park will always be in my heart as my favorite park within a city, but Parque del Buen Retiro is a close second. 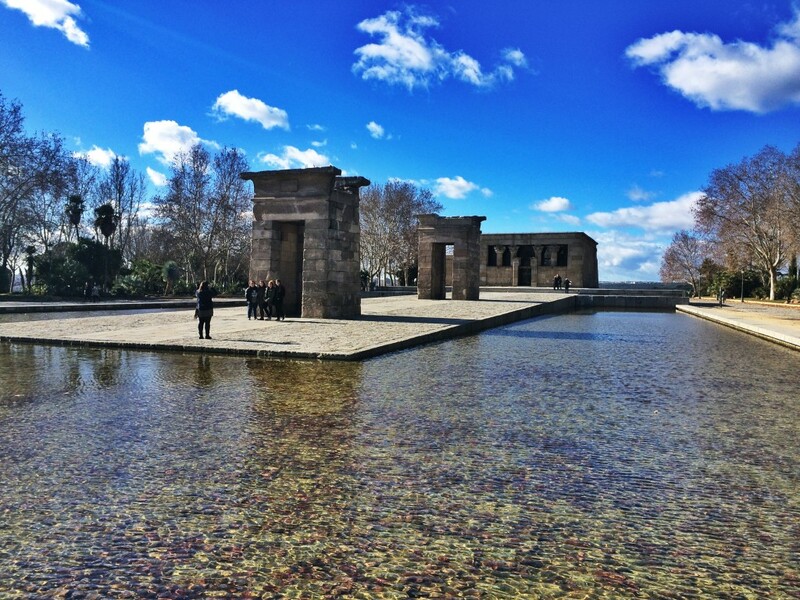 It’s the favorite spot for every Madrileño (Madrid local) to sit and relax when the sun is out or to get some exercise in all year-round. Retiro boasts a rose garden, a lake, many statues, and some remaining parts of the old Palacio del Buen Retiro that no longer exists. 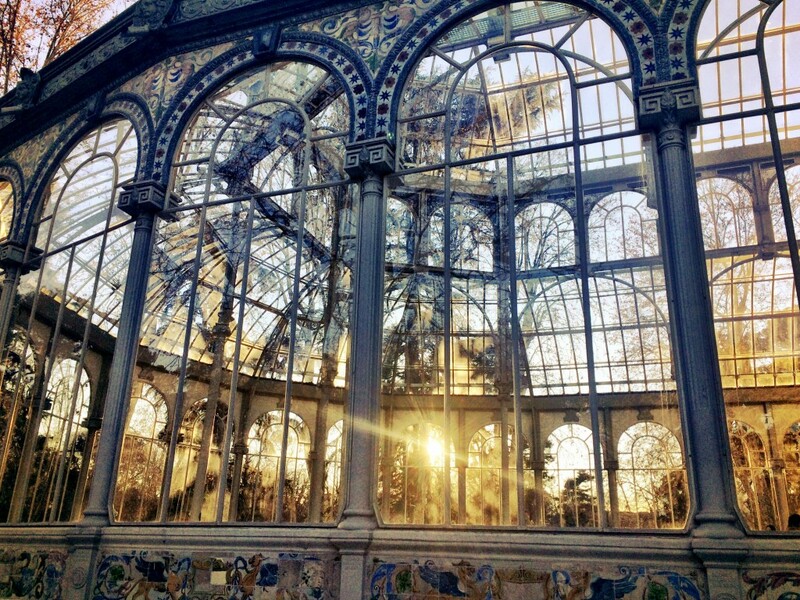 I like to go running in Retiro but only now did I find my new favorite place in the entire city: Palacio de Cristal inside the park. 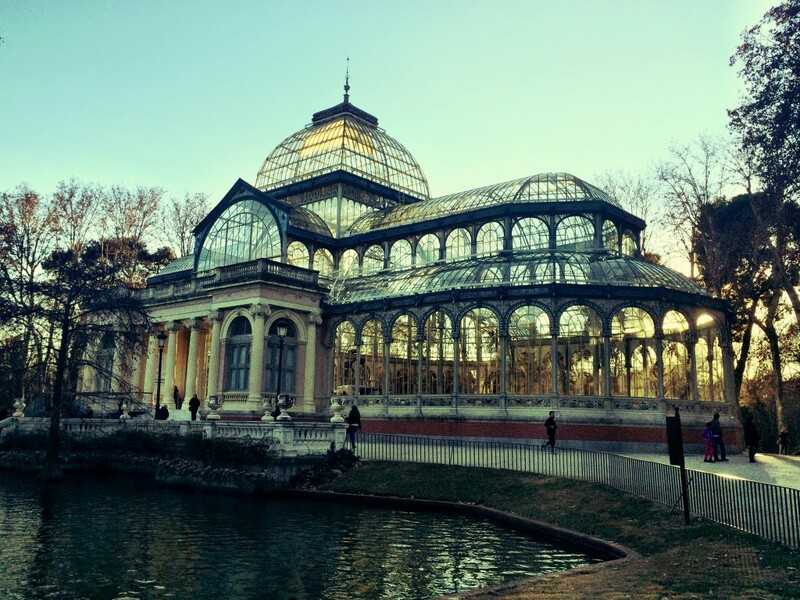 I had seen a few photos but can’t believe that in my many previous loops around Retiro I never took a stroll past this place. Made almost entirely of glass and adorned with ceramic tile, it is absolutely striking. Now used for art exhibitions, every angle of this palace looks perfect, especially at the “golden hour” when the light sears through the windows and bounces off every surface. I can’t wait to start ending my jogs here and stretch out on the lawn overlooking the front of the palace. I’ve already started imagining springtime picnics by the palace’s lake when it starts to warm up. I can’t believe I’ve lived here for so long without ever seeing it in the flesh! Before Neuschwanstein Castle, I said I wasn’t particularly interested in visiting castles. Palaces haven’t been at the top of my “must-see” list either. Maybe it’s the frugal backpacker in me, but I’d gazed beyond the gate to Palacio Real de Madrid a few times without ever having an interest in actually paying to go inside. With curious friends in town, we went for it! I usually think the outer facade of a palace or castle is more eye catching than the rooms inside, but the design of the rooms and foyer of the Royal Palace was so intricate and tastefully decorated. I’m so glad I finally entered the palace; I probably never would have if it weren’t for my friends! My curiosity = satisfied! 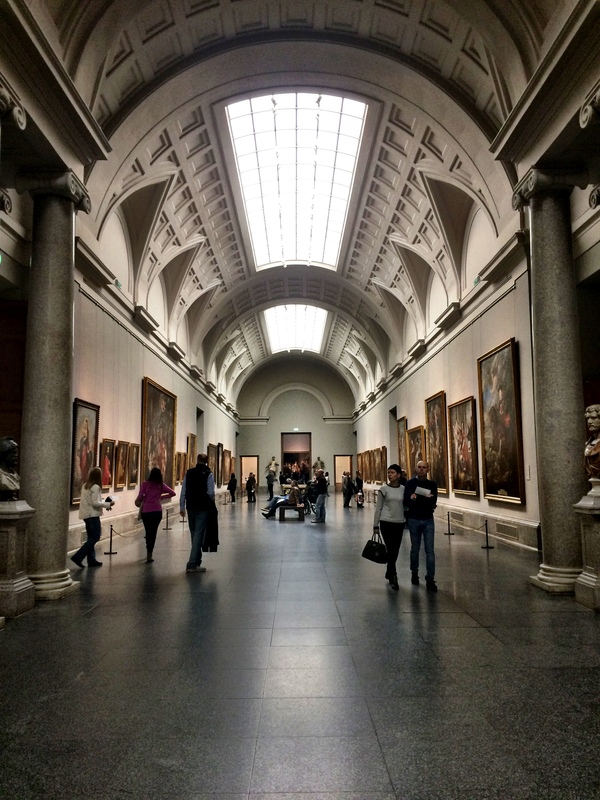 Visiting Madrid’s most coveted museums, the Museo Nacional Centro de Arte Reina Sofía (the modern art museum) and Museo del Prado was another experience I thought would be overwhelming. The museums have free hours, but having heard many horror stories from my friends about waiting in line for extended periods of time and eventually giving up before entering, I was prepared to never see the inside of the museums before closing time. Luckily, we visited the Reina Sofía during free hours and I finally set eyes on Pablo Picasso’s Guernica. Afterward, we pondered over Salvador Dalí’s paintings, forming our own interpretations of what he must have thought when he painted his visions. Nevertheless, I bit that bullet and enjoyed perusing the paintings of Francisco Goya, Diego Velázquez, and El Greco. Drifting from room to room, my friends and I and pored over the paintings while catching up on our lives since we had last seen each other. I love when fun events are happening in town for the day or weekend; it’s a great perk of living in a bigger city. Of course, my “tour” had to include going to Madreat, a food festival that occurs periodically in Madrid in which many restaurants and cafés set up tents with a few signature features to be tasted. With an amalgam of different types of cuisine in one place, food-obsessed patrons like myself go and gorge all day, long lines being the only thing slowing us down. 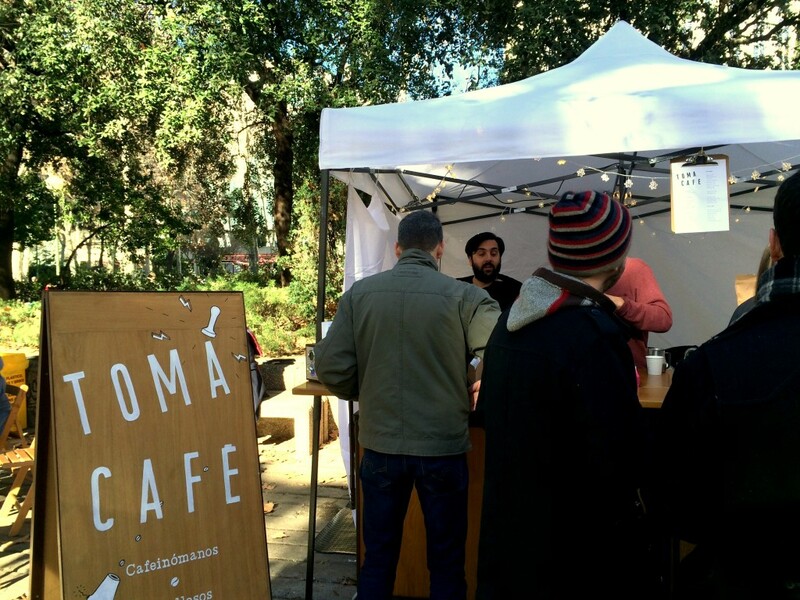 Toma Café, my favorite café in Madrid! 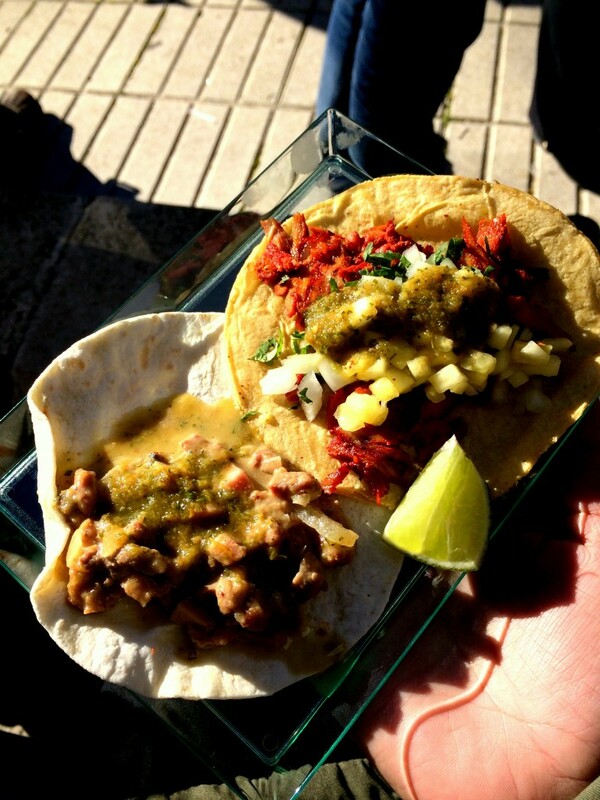 The tacos, arepa, and croquetas I ate were so worth the wait! I really love events like this in which I get to learn about and interact with local businesses in my community. It reminds me of how lucky I am to live in a city that has so much to offer, not just in terms of food, but also a close-knit community that wants everyone to support one another. Exercise outside. Move your workout from inside the gym to the outdoors! You’ll have a new perspective of your home city when running, cycling, doing yoga, etc. outside. 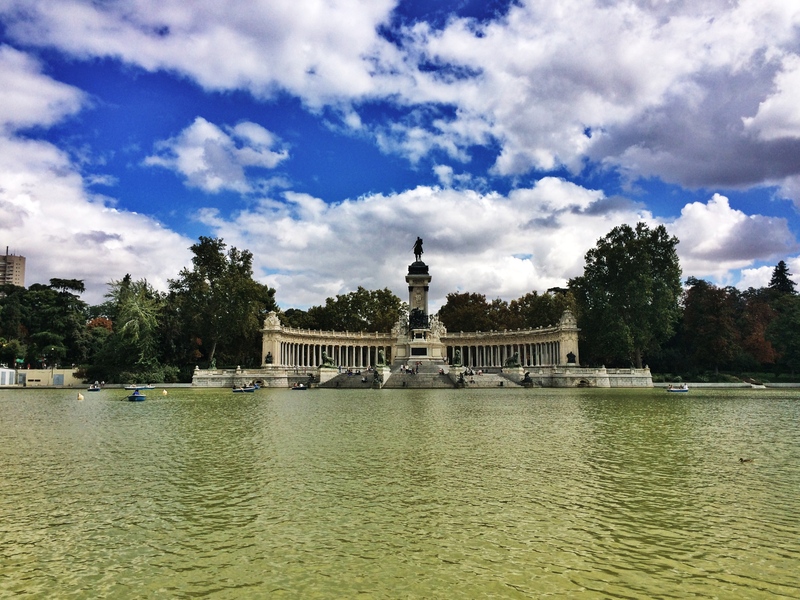 One of my favorite spots to stretch and exercise in Madrid is near the workout station in Retiro Park. It’s not just for the grassy space to work out, but it’s also kind of hilarious to watch guys compete with each other to see who can do the most pull-ups! Free entry. Take advantage of free museum hours and student discounts. Trust me, you will enjoy looking at those old and (sometimes) boring paintings so much more when it’s free! Search for upcoming events. 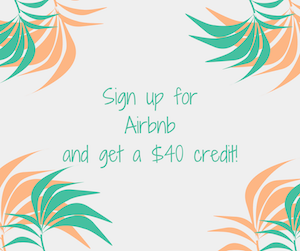 I’m constantly checking Yelp.com to see if any fun events are coming soon to Madrid. 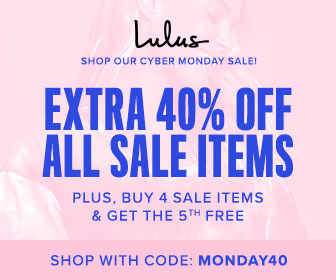 There’s always something new and exciting to check out! Look up. Seriously. Try walking around without headphones in your ears and your cell phone in your hand. I’m guilty of this too sometimes, but you will appreciate your surroundings so much more when you are actively looking and listening to the world. That homeless-looking person with the accordion in the metro might just be singing a tune that will strike a chord with you and make your day! Before I left New York City, I never revisited the Empire State Building or the Statue of Liberty. Though I had seen them many times from afar, I was a kid the last time I visited. I always thought there was plenty of time to be a tourist in my own city but I moved away last year before getting a chance to do so. 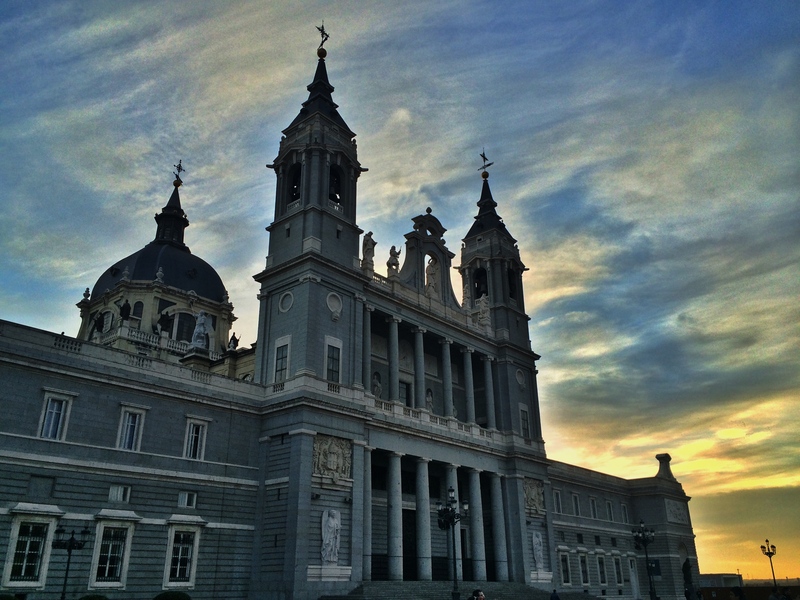 Being a tourist in Madrid opened my eyes to the beauty of my home that I hadn’t noticed before. Since this tourist experience, I now have a laundry list of new places I want to discover and I found a new appreciation for the tourist attractions that draw people from afar. After all, it was that first hostel walking tour that catapulted my interest in moving to Spain, and look where I am now! Have you ever taken to the streets of your home city as a tourist? What was your experience like? Pingback: Through My Eyes: January 2015 - Lavi was here. Pingback: The El Clásico Debate: Madrid or Barcelona? » Lavi was here. Pingback: Through My Eyes: October 2015 » Lavi was here.